On the face of it, the recent spat between Edward Scicluna, the finance minister, and David Casa MEP looks like your garden variety, silly season, overblown, partisan quarrel that no one with a half-fulfilling life in the real world should care about. I wish that’s all it was. It has the right elements: the spin, the outrage, the outraged reply to the original outrage, even a comic streak. But context is all, and this episode should be of public concern. For those who missed it, the spat unfolded in four steps. First, Scicluna uploaded a Facebook post in which he berated Casa for badmouthing his own country abroad. Yes, it’s heavy spin but, as far as politics goes, par for the course. Next, one of Scicluna’s Facebook followers declares Casa a traitor who deserves to be hanged. Scicluna, or whoever manages his page, endorsed the comment. Third, Casa protested loudly and said a police report against the minister would follow. 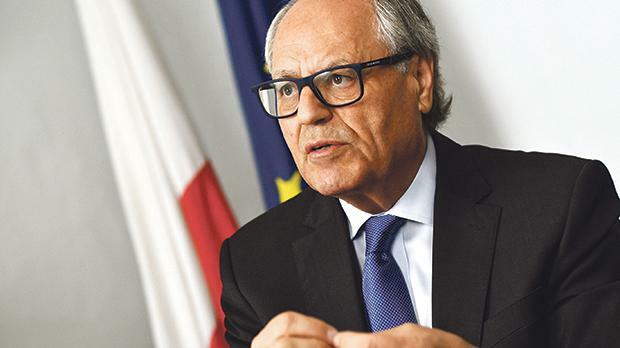 Finally, six hours later, Scicluna snapped back that the endorsement was an ‘obvious mistake’, that Casa should have known, and a simple phone call would have cleared up the error. There’s something unintentionally comic about this reply. Effectively, Scicluna was outraged that Casa took him at his word. Casa preferred to retort that the original offending comment remained on Scicluna’s page. What’s not trivial about all this? The expression ‘he deserves to be hanged’ is the Maltese equivalent of ‘he deserves to be taken out and shot’. It’s hardly hate speech in the legal sense. And no one, least of all Casa, believes that Scicluna truly endorses hanging. Admittedly, Scicluna should have done more: offered a dry apology, adding that he dissociated himself from all such language and that the offending post had been removed. So can we say Scicluna under-reacted while Casa overreacted? In normal circumstances, yes. But we’re back to context. When is it harmless to say things like, “You deserve to be taken out and shot”? It’s when it’s obvious hyperbole – when the gap between the purported offence and the punishment is obviously out of all proportion. If I’m served a cold watery espresso in Rome, it’s all very well for me to quip that it would never have happened under Mussolini. But it’s a sick joke to crack in Tel Aviv. Likewise, it’s one thing if, while bantering with an American friend of European ancestry, I say that hanging is too good for him. But the good humour would turn sour if I say it to an Afro-American friend from the deep South, for whom hangings for trivial offences are part of family history. The moment the hyperbole is lost, the minute the language begins to cut to the bone, the talk loses its harmlessness. In our case, hanging was being referred to in the context of Casa being labelled a traitor. And this against the broader background of escalating political tension: of rising mutual contempt, together with trolling, mobbing and, on all sides, increasing vituperation. Political, man-made climate change is taking place. Each such incident, on its own, is not important. In normal times each would rightly be dismissed as relatively trivial. Taken together, however, they contribute to a raising of the political temperature that is approaching dangerous levels. In the social media era, Malta is not alone in seeing politicians and public figures addressed in poisonous, abusive terms by members of the public. In the UK, certain politicians – government and opposition – are routinely targeted. Women MPs are subjected to particularly vile abuse. However, there is cross-party agreement that such language should never be seen to be endorsed or legitimised. Hence why, in a case like ours, a British minister would have immediately distanced himself from the language (while also claiming it was an obvious mistake, after which everyone would have moved on). It’s the same in the US. Back during the 2008 presidential campaign, a woman at one of John McCain’s rallies rose to cast doubts about Barack Obama’s true loyalties. McCain (who made no secret he held Obama’s politics in contempt) cut her short: Obama was a decent man, he said, with whom he just happened to have disagreements on fundamental issues. Oh, and had he not done so, the media would have been on McCain like a tonne of bricks. Why is this sanitary distance insisted on? It’s not because there’s an automatic line leading from vitriol to physical violence. But vitriol raises the chances that someone could be crazy enough to do something unthinkable. The whole point of democracy is to settle conflicts peacefully through wide public consultation. Debate that’s polluted by verbal violence risks undermining democracy twice over. It destabilises the peace, and hence inhibits many people from participating. If we’re too close up to events in Malta to see this happening, we can perhaps take a look at the US. There, irresponsible politicians like Donald Trump (especially) and Representative Maxine Waters (Democrat) have each endorsed language and behaviour that crosses the line between acceptable partisanship and the unacceptable. Trump has endorsed the idea that the mainstream press is the enemy of the people. Now, journalists covering Trump have begun to feel unsafe. Both The New York Times and the Washington Post have had to beef up their security arrangements. Waters has said that Trump aides should be challenged wherever they go. The result: some unpleasant public incidents. I think Casa’s reaction did not help his case. It’s a waste of police time to file a report against Scicluna. The latter’s mistake was a political one – not distancing himself from a fan, not showing McCain’s courage – not a police matter. But let’s be clear there were two mistakes: the ‘endorsement’, and more seriously, the omission of an explicit rejection of harsh language. Not for the first time, Scicluna’s more serious error lies not in what he did but in what he shrank from doing. Politicians, public figures and, yes, pundits, cannot control what is said on the social media. But they can choose to distance themselves or to endorse, to discourage or to incite. We’re at the stage where even sins of omission are irresponsible. Let’s pull ourselves together.